James Ferrara scored and was man-of-the-match for Phantoms in Sheffield. Ruthless Peterborough Phantoms continued their prolific start to 2017 by putting Sheffield Steeldogs to the sword for the second successive night. The high-scoring city outfit eased to a 6-1 Monday (January 2) triumph at iceSheffield to follow up a 10-2 drubbing at Planet Ice 24 hours earlier. Wehebe Darge (diving) scored twice for Phantoms in Sheffield. They are a pair of impressive results – admittedly gained against opponents weakened by suspensions – which have helped to strengthen Phantoms’ grip on third place in the English Premier League standings. Sam Towner made the breakthrough in the second period last night before Phantoms found the net on a regular basis in the final session. James Ferrara doubled the advantage in a powerplay situation only to see it reduced by Steeldogs man Callum Brownley within 30 seconds. But that proved to be just a temporary hiccup as a quickfire Wehebe Darge brace settled the contest. Happy Phantoms coach Slava Koulikov. A powerplay strike from Darius Pliskauskas and a late Martins Susters effort completed an ultimately emphatic success and gave Phantoms’ goal tally (they’re now the joint-third highest-scorers in the second tier) further boosts. 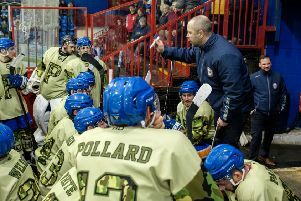 Coach Slava Koulikov said: “We have to remember that Sheffield are missing guys, including two good imports, but we can be very pleased with the two performances we have produced against them. “A coach is always going to be happy after seeing his team score 16 goals in two nights and only concede three. “It can sometimes be hard to get fully switched for a return game after such a big win the previous night. “But we approached it in the right manner and we were the better team for the vast majority of it. Phantoms were again without forward Will Weldon last night and are no closer to learning the full extent of the knee injury he sustained in the Boxing Day victory at Milton Keynes. Fellow frontman Marc Levers also sat out the trip to Sheffield as he plays through the pain of a hernia problem whenever possible. Koulikov is mulling over whether or not to add to his roster for the remainder of a campaign which continues this weekend. Phantoms face a third clash in eight days against Sheffield when welcoming them back to Planet Ice this Sunday (January 8, 5.30pm). Before then the city side must negotiate a tough Saturday (January 7, 6.30pm) trip to reigning champions Basingstoke.